By Doug Weaver, Director of Instruction, Palmetto Dunes Golf Academy. Make a point to improve your swing and refine your game this spring. A: Always perfect for golf, with mild temperatures and gentle ocean breezes, April on Hilton Head Island is my favorite month. We have the best players in the world at the RBC Heritage Classic. We have the best golf courses on our award-winning Island. We have long days that allow us to spend time on the beach, ride bikes or fish before or after a round of golf. P: Palmetto Dunes offers many golf activities throughout the spring. Enjoy golf classes for everyone, with all the equipment included at no extra charge. The Lil Swingers Class for children ages 3-7 is fun and effective. The kids learn a song for each shot that gives them confidence, structure, rhythm and success. Parent participation is required, which teaches them to be better coaches. The Beginners Class is a great place to start for anyone wondering if golf is for them. The Back to Basics Class or Short Game 1 and 2 are designed for golfers of all skill levels. These classes are perfect for small groups, allowing the pro to give members of your group one-on-one attention and provide supervised, constructive practice time. R: Resurrect your game by playing with a golf pro. Palmetto Dunes Golf Academy offers a playing lesson on the course, known informally as “Play with the Pro and Learn as You Go.” Most golfers are unaware of what their strengths and weaknesses are. It is similar to being in a high school English class, where the student turns in the required homework. The teacher can coach the student on the grammar, sentence structure, subject matter and organization. After time with the teacher, the student can return to writing the paper with more confidence and greater enthusiasm. The best way to improve in golf is to work under the supervision of an experienced professional. I: Involve yourself in golf by attending the free class and exhibition Monday from 4 to 4:50 p.m. at the Robert Trent Jones Golf Course. This hands-on class is interactive, and you might even win a prize. L: Life is longer when you play golf correctly. Studies have demonstrated that the best medicine is frequent doses of fresh air, sunshine and light exercise. When you play or practice golf for one, two or three hours, the effect is similar to taking a hike, walking up and down the gentle hills with moments of stopping and enjoying the view and nature. The golf shots do not require a lot of energy or stress. The pros may look like they are exerting great effort, but that is on one shot — the drive — where distance and power are desired. On the other 90 percent of the shots, finesse and accuracy matter most. Golf is not an easy game, but it is a game of ease. Studies reveal that professional golfers live longer than the most successful business people. Why? Because golf professionals have learned how to relax at work. Have fun on the course, and enjoy our beautiful spring weather. I hope to see you out on the green! 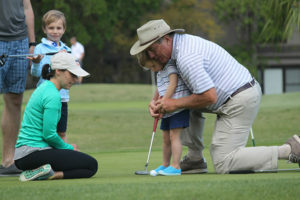 A former PGA Tour pro and member of the local golf Hall of Fame, Doug Weaver is the Director of Instruction at the Palmetto Dunes Golf Academy. He conducts “Where Does the Power Come From?”, a free clinic and demonstration, every Monday at 4 p.m. (843) 785-1138, (800) 827-3006 or www.palmettodunes.com.